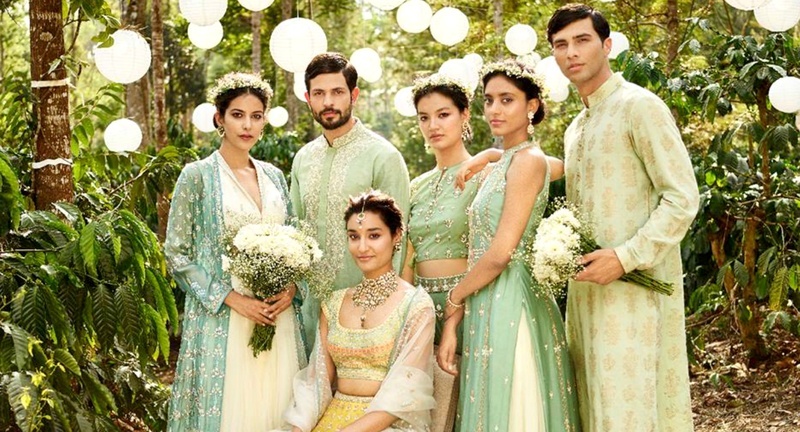 Anita Dongre’s latest Songs Of Summer Collection is everything a bride needs this summer! Anita Dongre’s latest collection called ‘Songs of Summer’ is like walking down to a beautiful summer garden - with floral prints and muted colors. The tones of yellow, powder blue, sage, blush and white with birds, botanical and floral motifs are perfect for your summer wedding! Anita Dongre has tried to soothe the mild and sweet burn of summer sun with cool supple textures and the same is evident in her lehengas. With a lot of pastels, gota patti, dori and zari embroidery the lehengas are perfect for a summer -garden wedding. How strikingly stunning is this gown? A no brainer for your summer cocktail or reception! Her saree collection with motifs of flowers, butterflies and honey bees makes it an ideal summer dream! What we love about the collection is the use of pastel colours and the intricate embroidery on it. Also, this banarasi brocade saree, handcrafted with gota patti is love. These are handcrafted with traditional Rajasthani embroideries and have motifs of summer garden bloom. These are apt for all your pre-wedding functions when you are trying to beat the summer heat. Songs of summer also has an exquisite collection of tops, tunics and tulle and maxi skirts, when paired together they look breathtakingly beautiful. Ok, we have to admit we are going gaga over the use of these dainty flowers in the bridal hairdo making it totally apt for a summer wedding with a boho touch. We are loving the jewellery comprising of uncut Diamonds with intricate designs inspired by the beautiful nature. How stunning are they? The menswear collection saw a lot of handwoven cotton and block printed motifs for the summer. We also saw a lot of subtle hues of salmon and sage green blend with shades of coffee colour. How gorgeous is this cinnamon hued Bandi boasts of tonal intricate 'kantha' embroideries on the panels. We still can’t get over this collection, can you?